I'm not really a fan of modern art and know next to nothing about it. 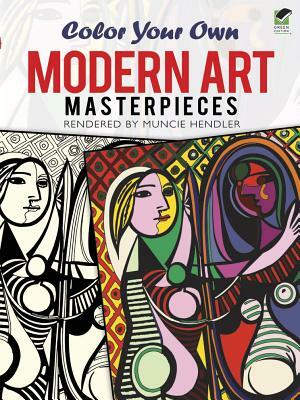 As I flipped through the book, I only recognized a few of the paintings and about half of the artists. Like all coloring books, this book has black-line drawings, with no indication of what color any particular space should be. The inside covers have color reproductions of the originals, so that you could copy a particular masterpiece if you wanted to do so. That wasn't what I wanted to do. 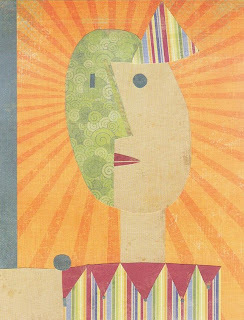 I chose a design that appealed to me (Paul Klee's "Clown") and scanned the page without looking at the color version. I don't know what Klee intended with this painting or what he was trying to say, but I knew that I wanted my version to be colorful and bright like I imagine clowns being. Rather than painting or coloring, my medium was paper. I started with a bright orange sunburst as my background, then carefully cut papers to fill in each section. Here's how my clown turned out. 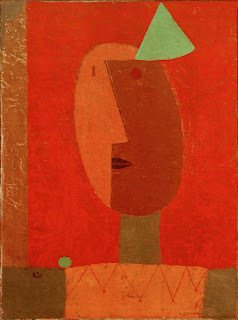 Here is Paul Klee's original. I've done a fair amount of Googling, but I can't find any analysis of this work. I'd love to know what he intended and how completely far off the mark my version is. Anyone out there know anything about this piece? For the record, Trevor started this project with me, selecting a more abstract masterpiece to work on. He struggled to cut papers to fit exactly in the spaces and gave up after about 20 minutes. I think if we'd been painting or coloring, he would have happily finished. I tried to convince him to switch media, but he was determined that it would be paper like mine or nothing at all. I think this would be a fun project to do with an elementary-aged art class... though not with paper piecing, as that is tedious and challenging! It would be fascinating to give each student black-line copies of famous masterpieces, have them select their own color/media to complete the project, then compare and contrast the student version with the original. I really love how yours turned out!! Loving how you chose your patterns!! That would make a great art project. I love the comparison. Interesting that yours includes most of the colors of the original. I thought I already did follow, but apparently not. I do now! This is a whole lot of fun Cindy! I really like your take on the art. Very cool idea. I like the idea of printing them and having the kids paint/color. TFS! You always have such interesting and unusual projects on your blog. I love popping over to see what you're up to! This is a great piece. I love your version and how it turned out. So creative.